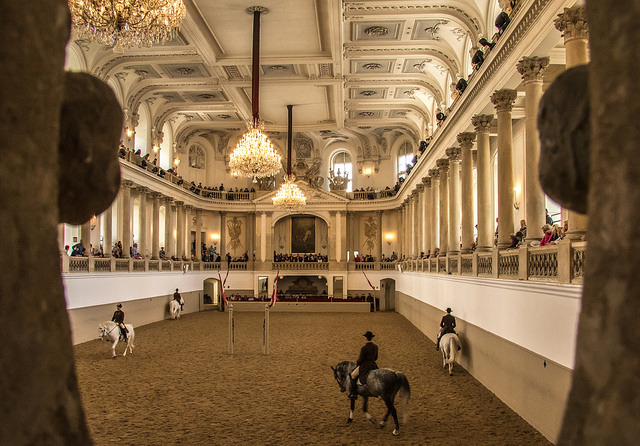 Sonja Klima, the President of the Ronald-McDonald Kinderhilfe and ex-wife of former SPÖ Chancellor Viktor Klima has been named the new head of Vienna’s famed Hofreitschule (Spanish Riding School). The Aufsichtsrat (Supervisory Board) considered Klima the best candidate for the role and made their decision known on Thursday evening; the Beirat (Advisory Board) opposed the decision after unanimously recommending Herwig Radnetter, a veteran rider and the administrative director of the arena who has been working at the Hofreitschule for over 40 years. According to the Beirat, only Radnetter fulfilled all the requirements of the job as advertised. According to Die Presse, Klima has extensive media experience and expertise in marketing, fundraising and public relations which were deciding factors in her appointment. Johann Riegler, who is responsible for training horses and riders, confirmed that Klima would be “the face of the organization,” while he would handle the management of the riding arena. A report in Die Presse also revealed that the Ministry of Agriculture, currently headed by Elisabeth Köstinger of the Austrian People’s Party (ÖVP) had allegedly pressured the Supervisory Board to decide in favor of Klima.